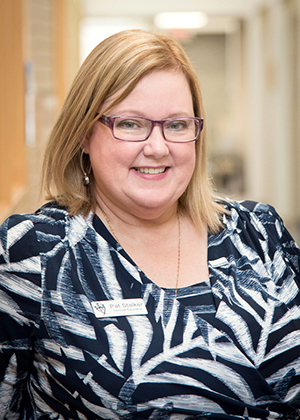 Pat Stalker, a devoted nurse from London Health Sciences Centre has proudly earned her de Souza Nurse Designation as a symbol of her perseverance and commitment to cancer care. Earning this designation involved the completion of courses as well as a clinical fellowship, which she focused on Radiation Oncology Therapy. She developed a deeper understanding of radiation therapy, including planning, treatment, quality assurance and the overall patient experience. Currently, Pat works as a Clinical Educator for the London Regional Cancer Program, covering both inpatient and outpatient areas. Pat is also a de Souza Institute Chemotherapy Facilitator. Her day-to-day practice is even further enriched with the latest knowledge, skills and best practices, so that she may continue to positively influence her nursing colleagues, patients and their families.